This year, we have decided to start the New Year off the right way. This year, we are heading out on New Years Eve to the last place in the states to ring in the new year, Kauai. I’ve never been anywhere tropical before. I’ve always thought that hooded sweatshirts and wool socks were typical beach wear. So the thought of sipping Mai Tai’s on warm sandy beaches and swimming in warm ocean water is delightful. In the meantime, we will return to see these cut nectarine branches in bloom (hopefully), our annual cover crop sprouted (which we just now finally planted! ), and the excitement to start a new year. This year will be a good year, I can feel it. I have a lot of fun ideas for this blog space for when I return. Have a very Happy New Year. I’ll drink a mai tai for you all! 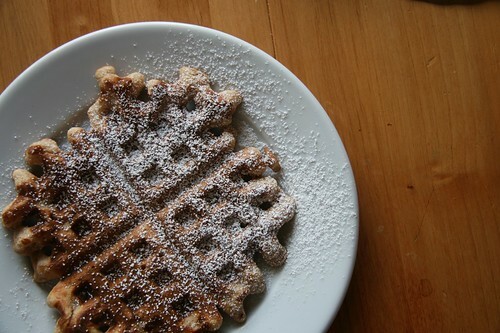 Oh sure, we don’t do snow much around these parts, but we do make a mean snowflake waffle in our kitchen. Here’s to wishing you all a very Merry Christmas! Any Norwegian Readers Out There? 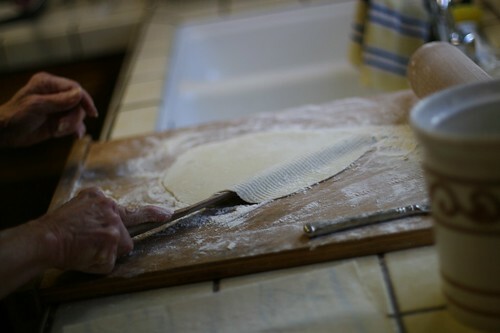 This past weekend my sister called the ladies of the family together for a Lefse making party. Lefse, a potato based tortilla, has always been a staple at our annual family Christmas get togethers, but for years now, since my Norwegian grandmother became older and then passed away, we’ve only had store bought from Nordic House in Oakland. Store bought lefse are pretty awful when you compare them to homemade. 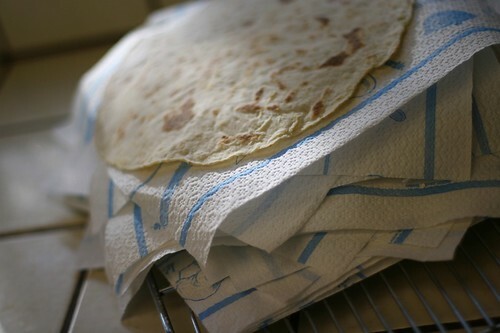 The flour-y, potato-y smell of a fresh grilled lefse is such a familiar and comfortable smell to me. Spread it with butter, roll it up and enjoy. 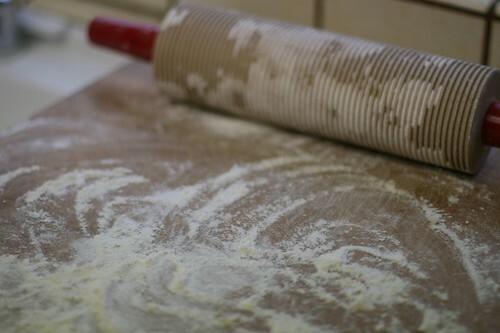 With my father recruited to watch all the little grandchildren we mustered up every last cell of Norwegian blood we have left in our bloodline, got out the funny looking lefse rolling pin, rolled up our sleeves, covered ourselves in flour and got to work. 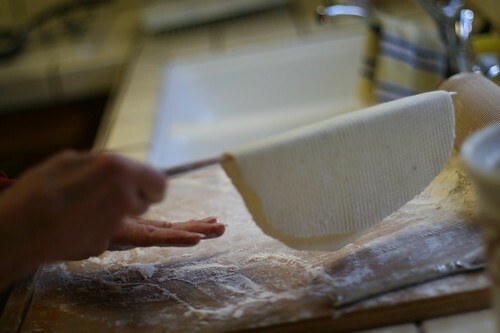 After you roll them out, you need a this special flat lefse stick (this one my father crafted) to slide underneath, lift it up and lower and then roll it onto the griddle. A stovetop griddle is far slower than the hearth top cooking that my dad remembers as a kid, but we built up a nice little pile of lefse. And the joy of getting together as a family over the holidays to carry on a family tradition that almost got lost was priceless. There are so many traditions associated with the holidays, new ones that my little family have created, ones that I remember from my childhood, but to participate in one that has been in our family line for generations upon generations was very special. Thanks for getting us all together, Marga. Although, contrary to the family history, we decided to skip the Lutefisk. 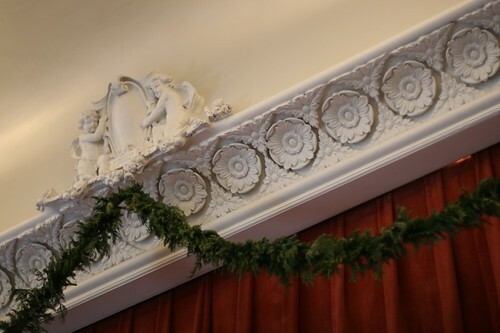 Do you have any long lived holiday traditions in your family? No, this post doesn’t have anything to do with gardening or food or any of my normal topics, but when my four year old filed into this soulful theater with the rest of his little schoolmates singing this it made me all teary eyed and I thought I would share. We send him to a Montessori school in our 100 year old community center that places strong emphasis in developing each childs true sense of being, something that is very important to Scott and I. We hope in this big world full of commercialism and keeping up with the Jones’ that both of our boys figure out just who they are and find the place that is just right for them. May we all find the place that’s just right for us. Do you mind if I talk about milk today? Milk has been on my mind lately. A funny thing to spend your quiet moments thinking about, I realize but, that’s me and the way I think. I never really thought much about milk until we started giving it to the boys when they turned one. We always just bought whatever low fat milk was the least expensive before we had kids because we used it sparingly in our diet and we were on a budget. Milk was an after thought. And every once in a while we’d buy Straus Family Creamery milk because it was so neat that it came in the glass bottle with the cream at the top. We treated more as a novelty than anything else. But within the last year or so my thoughts on milk have become more passionate. There’s so much to consider when buying milk, low fat, non fat, whole fat, and what about raw? Then there is the price. Milk is somewhat expensive to begin with but then the organic is even more expensive and switching to a diet of raw milk might cause you to take out a second mortgage on the house. And should we even be drinking cows milk at all? What about the rice milks and soy milks? Then there is my friend who only would give her daughters goats milk because cows milk is harder to digest. There’s so much to consider it makes my brain hurt. After reading The Omnivore’s Dilemma , Scott and I made the switch to exclusively drinking organic milk. His descriptions of the mid-west feed lots and corn fields turned our eating around in a lot of ways, frankly. When babies are in there second year between the ages of one and two, it’s recommended that you give them about four glasses of milk a day. That’s a lot of milk, especially when you have two thirsty boys. But we realized that all of the trace chemicals that collect in standard milk just wasn’t worth the savings. Then after reading In Defense of Food I became worried about the percentage of fat in the milk we drank. This book by Mr. Pollan had a big influence on me, but there is this one little sentence in that book that haunted me. He never really expanded on it or meant it to be a key point but for some reason I thought about it everytime I went to the store to pick up another gallon. 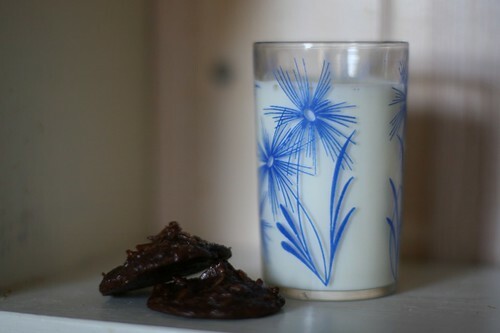 He said that low fat and non fat milk is often beefed up with dry milk to make it creamier. And that dry milk contains oxidized cholesterol, which is a bad kind of cholesterol. Not the good kind that whole, raw milk provides. This is the artery clogging kind of cholesterol. Knowing Scott’s family’s struggles with heart disease I take great concern in the health of all three of my boy’s (big and small) hearts. Bad cholesterol, even in tiny amounts, is not something I want to invite into their lives, or mine frankly. So we made a vow at that point to only buy whole organic milk. But now I’ve been thinking of raw milk. I keep hearing and reading more and more about it. I had heard of raw milk before and been a tad bit curious, but being a good ultra-pasturized raised American, it just seemed like inviting a whole lot of risk into your life by drinking it. I’ve been pregnant and breastfeeding for many years in a row and that’s always one of the biggest no-no’s: to eat unpasturized anything. So I always passed it up. But lately I’ve been thinking about it again. Both my father and Scott’s father were raised on farms and both drank raw milk growing up. And they survived just fine. Maybe this pasturization preaching that I’ve heard my whole life really isn’t as vital as I thought. If the idea is to eat things that are processed less and in a more whole state, shouldn’t raw milk be what we all drink? If pasturization makes milk completely devoid of nutrients, why do you we even bother to drink it? I’ve heard a few times now that raw milk is like liquid medicine. Is this true? I suppose the only thing holding me back at this point from converting to a raw milk drinker is the price. At our local grocery store a gallon of raw milk ranges from $16-$20/gallon! Versus $4 for standard milk and $6.49 for organic. We consume about two gallons a week so you can see how that would add up for us. I realize that we are incredibly fortunate in this economy to even be able to afford milk, let alone organic, let alone even contemplate paying for raw milk. And you realize too that switching to raw milk would only be the beginning. Soon we’d have to switch to raw cheeses, raw milk, raw ice cream and raw butter (which was $12.99/lb!!). If money were no object, I would switch us all over tomorrow. But like most folks, we have to keep a watchful eye on our spending habits. We had a new friend over yesterday for the afternoon. Not knowing that she was into nutrition or food at all she suddenly started telling me all about her families switch to raw milk. Isn’t that funny, how the world works? Just when your thoughts are all about milk, in walks a converted raw milk drinker into your family room to tell you all about it. Anyway it made me realize that I’m probably not the only milk thinker out there. Do you drink milk? What kind do you drink and why?? I just wanted to stop in quickly to say hello. This is a photo of just one of the many gifts my four year old brings me. 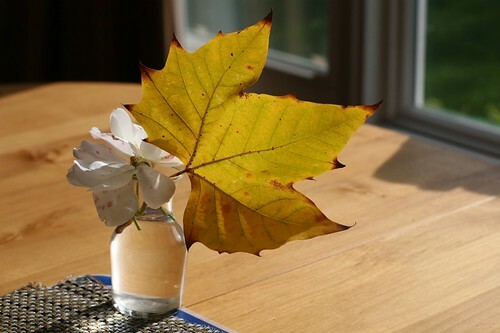 Simple little natural gifts. Aren’t they just the best? It’s been cold, hasn’t it? Saturday was our first really cold day and we were actually pretty excited about it. To celebrate we all spent as much time as our fingertips would allow outside, just taking in the cold air and the change in our garden. The peppers and tomatoes finally gave up their lives to the frost and we were joyful to see that the oranges are starting to turn, well, orange. The lemons are starting to ripen, some of the lettuce froze, the heartier greens are now a bit sweeter thanks to Jack Frost. I think that’s one of my favorite reasons to have such a garden, so that we can all together as a family experience the changes in the seasons so directly. I will be back in soon. I’ve been thinking of milk and have been wondering what your thoughts on milk were too. I’m writing a post about it now. I’ve had such a hard time putting words together on screen lately. Thoughts have been rushing through my head like wild fire and I’ve composed entire posts in my head while waiting to fall asleep. I’ve even imagined clicking ‘post’. Have you received those insomniatic posts on your RSS feeder? Those are always the good ones, the ones virtually written in the wee hours of the night without a pen in sight. This week, I hope to actually get them to you. Each year in December I try to inject a little more meaning behind my Christmas decor and take out some of the glittery lamé. While I’m not quite ready to sign us up for a No Shop Christmas or anything drastic, I do what I can to slow Christmas down, to be actually be present in the season, and I avoid shopping centers at all costs. And maybe it is an overly romantic idea, but I try to keep the consumerism down for my two young boys to a minimal level. We don’t show them cartoons that show commercials and we make doubly sure that this doesn’t happen at this time of year. I’ve found that filling our house full of things that remind me of the true merriment of the season helps focus me. Last year I read about how in Germany, at the begining of December they take a pruning of their apple tree, put it in a vase inside and in about 20 or so days it will be in full bloom…just in time for Christmas. 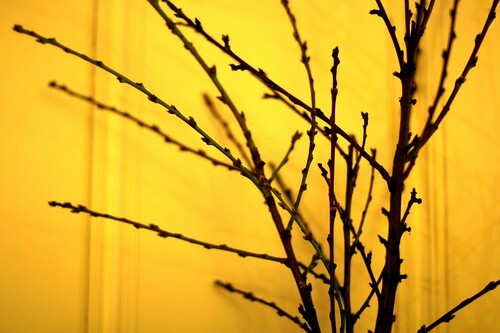 It just so happened that the day I read that article, Scott happened to be pruning our dormant apple tree so I took a few branches and put them in a tall vase on our mantle. With a healthy dose of scepticism but with my ever ensuing hope, I kept the vase full of water. And wouldn’t you know? Right around Christmas Day it burst open with little pink blooms. I was all ready to show you how we did this this year, but it was such a warm fall that our apple tree is still full of leaves. 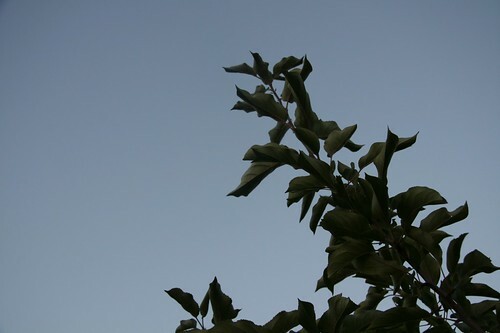 However if its been cold where you live and the apple trees have lost their leaves, give it a try. Seeing those little pink flowers during the longest, darkest days of the year is a welcome sight indeed. 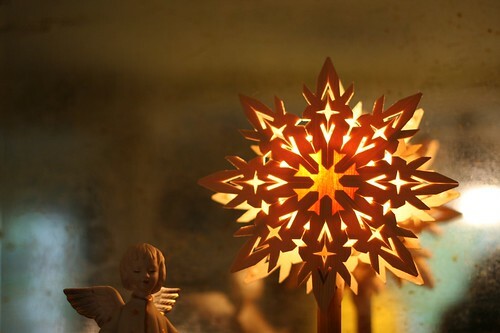 This year, however, I bought this Swedish welcome star (pictured at the top). And I just love it. I’ve never been to Sweden, but I’ve read that they place these in their front windows to symbolize light in the long dark days and to welcome visitors to their house. We don’t have a front window to place this in, but I put it in front of this old mirror in our family room and the beautiful light gets reflected all over our living area. Sitting next to the music box angel that I inherited from my grandmas house makes it even more meaningful. 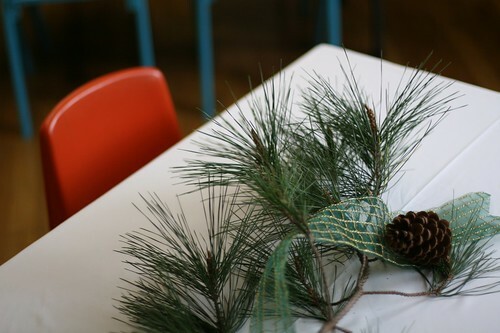 What do you do to celebrate the holidays that’s a little more natural and a little less consumeristic?